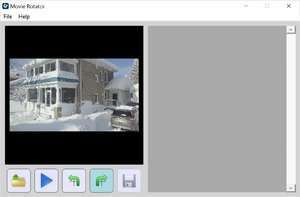 With the free Movie Rotator software you can quickly and easily rotate digital camera videos easily and reliably, with the click of a button. If you have digital movies which are in a landscape orientation, and you want them in portrait orientation, Movie Rotator can rotate them so that you can view them easily. Movie Rotator 2 works on Windows 7 and later, and can rotate most videos that Windows can play, including most Apple Quicktime (*.MOV), MP4, Windows AVI (*. Version 2.0.1 is a freeware program which does not have restrictions and it's free so it doesn't cost anything. For security reasons, you should also check out the Movie Rotator download at LO4D.com which includes virus and malware tests. Additional screenshots of this application download may be available, too. 2.41 out of 5 based on 7 ratings.